BOCA RATON, Fla.--(BUSINESS WIRE)--Dec. 5, 2016-- TherapeuticsMD, Inc. (NYSE MKT: TXMD), an innovative women’s healthcare company, today announced positive top-line results from its pivotal phase 3 Replenish Trial of TX-001HR, an investigational bio-identical hormone therapy combination of 17ß-estradiol and progesterone in a single, oral softgel, for the treatment of moderate to severe vasomotor symptoms (VMS) due to menopause in post-menopausal women with an intact uterus. TX-001HR estradiol 1 mg/progesterone 100 mg and TX-001HR estradiol 0.5 mg/progesterone 100 mg both achieved all four of the co-primary efficacy endpoints and the primary safety endpoint. TX-001HR estradiol 1 mg/progesterone 100 mg and TX-001HR estradiol 0.5 mg/progesterone 100 mg both demonstrated a statistically significant and clinically meaningful reduction from baseline in both the frequency and severity of hot flashes compared to placebo. TX-001HR estradiol 0.5 mg/progesterone 50 mg and TX-001HR estradiol 0.25 mg/progesterone 50 mg were not statistically significant at all of the co-primary efficacy endpoints. The estradiol 0.25 mg/progesterone 50 mg dose was included in the clinical trial as a non-effective dose to meet the recommendation of the FDA guidance to identify the lowest effective dose. 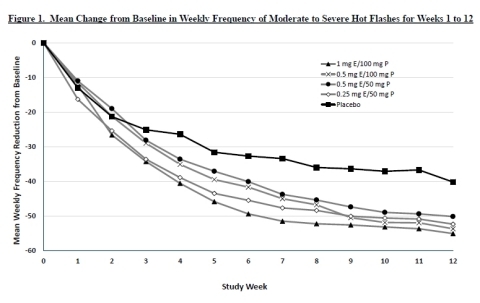 As outlined in the FDA guidance, the co-primary efficacy endpoints in the Replenish Trial were the change from baseline in the number and severity of hot flashes at weeks 4 and 12 as compared to placebo.1 The primary safety endpoint was the incidence of endometrial hyperplasia with up to 12 months of treatment. General safety was also evaluated. The results of the Replenish Trial (p-values of < 0.05 meet FDA guidance and support evidence of efficacy) are summarized in the below table and included multimedia. The trial also demonstrated a dose response favoring the higher doses of estradiol in combination with progesterone. The availability of multiple doses of TX-001HR would allow for individualized therapy to meet the needs of a diverse population of women. The most common adverse events (>5 percent) reported on average in all the active treatment groups were headache, nasopharyngitis, breast tenderness, and upper respiratory infection. There was a very low reported incidence of adverse events of somnolence with TX-001HR, in contrast to commercially available oral progesterone where somnolence has been reported as a significant side effect. There were no unexpected safety signals. The Replenish Trial evaluated various secondary endpoints using well-validated patient reported outcome tools, including the Menopause-Specific Quality of Life (MENQOL), the Clinical Global Impression scale (CGI), and the responder analysis rate. Both TX-001HR estradiol 1 mg/progesterone 100 mg and TX-001HR estradiol 0.5 mg/progesterone 100 mg demonstrated clinically meaningful and statistically significant improvements in the secondary endpoints using these tools. Additional efficacy and safety analyses of the Replenish Trial data are ongoing and TherapeuticsMD plans to submit the full Replenish Trial results for presentation at future scientific meetings and for publication in peer-reviewed journals. TX-001HR is a novel combination of 17ß-estradiol and natural progesterone under investigation for treating vasomotor symptoms related to menopause. If approved by the FDA, TX-001HR would represent the first bio-identical estradiol and progesterone approved for use in a single, combined product for postmenopausal women with an intact uterus offering women an important alternative to both the available FDA-approved synthetic (non-bio-identical) hormones and the unapproved compounded bio-identical hormone products. Bio-identical refers to estradiol and progesterone that are molecularly identical to the hormones circulating naturally in the woman’s body. An estimated one to two-and-a-half million women in the U.S. are using unapproved, compounded bio-identical hormone therapies to treat vasomotor symptoms.2 Leading medical societies and the FDA advise that compounded hormone therapies may pose significant risk to women given lack of efficacy and safety data and lack of uniform manufacturing processes. TX-001HR was developed using TherapeuticsMD’s unique SYMBODATM technology (meaning “similar to the body”), which enables partial and complete solubilization of estradiol and progesterone into medium-chain fatty acid oils often derived from coconut oil. Additionally, a live webcast of the conference call can be accessed on the company’s website, www.therapeuticsmd.com, under the “Investors & Media” section. TherapeuticsMD, Inc. is an innovative healthcare company focused on developing and commercializing products exclusively for women. With its SYMBODA™ technology, TherapeuticsMD is developing advanced hormone therapy pharmaceutical products to enable delivery of bio-identical hormones through a variety of dosage forms and administration routes. The company’s clinical development pipeline includes two phase 3 products. The company also manufactures and distributes branded and generic prescription prenatal vitamins under the vitaMedMD® and BocaGreenMD® brands. More information is available at the following websites: www.therapeuticsmd.com, www.vitamedmd.com and www.bocagreenmd.com. This press release by TherapeuticsMD, Inc. may contain forward-looking statements. Forward-looking statements may include, but are not limited to, statements relating to TherapeuticsMD’s objectives, plans and strategies as well as statements, other than historical facts, that address activities, events or developments that the company intends, expects, projects, believes or anticipates will or may occur in the future. These statements are often characterized by terminology such as “believes,” “hopes,” “may,” “anticipates,” “should,” “intends,” “plans,” “will,” “expects,” “estimates,” “projects,” “positioned,” “strategy” and similar expressions and are based on assumptions and assessments made in light of management’s experience and perception of historical trends, current conditions, expected future developments and other factors believed to be appropriate. Forward-looking statements in this press release are made as of the date of this press release, and the company undertakes no duty to update or revise any such statements, whether as a result of new information, future events or otherwise. Forward-looking statements are not guarantees of future performance and are subject to risks and uncertainties, many of which are outside of the company’s control. Important factors that could cause actual results, developments and business decisions to differ materially from forward-looking statements are described in the sections titled “Risk Factors” in the company’s filings with the Securities and Exchange Commission, including its most recent Annual Report on Form 10-K and Quarterly Reports on Form 10-Q, as well as reports on Form 8-K, and include the following: the company’s ability to maintain or increase sales of its products; the company’s ability to develop and commercialize its hormone therapy drug candidates and obtain additional financing necessary therefor ; whether the company will be able to prepare a new drug application for its TX-001HR product candidate and, if prepared, whether the FDA will accept and approve the application; whether the FDA will approve the company’s new drug application for its TX-004HR product candidate and whether any such approval will occur by the PDUFA date; the length, cost and uncertain results of the company’s clinical trials; the potential of adverse side effects or other safety risks that could preclude the approval of the company’s hormone therapy drug candidates; the company’s reliance on third parties to conduct its clinical trials, research and development and manufacturing; the availability of reimbursement from government authorities and health insurance companies for the company’s products; the impact of product liability lawsuits; the influence of extensive and costly government regulation; the volatility of the trading price of the company’s common stock and the concentration of power in its stock ownership. PDF copies of the company’s historical press releases and financial tables can be viewed and downloaded at its website: www.therapeuticsmd.com/pressreleases.aspx.